As we approach the end of 2015 there is lots of talks about goals and resolutions for 2016. There is nothing wrong with goals, NOTHING. However year after year for most people the cause frustration instead of motivation. So this year I want to encourage you to think a little differently this year, instead of setting a few big goals try setting smaller achievable ones that will move you towards your big goal. Lets say you want to save more money, maybe a small goal would be to cut your dining out budget or even start calling your Internet/cable/cell phone companies and lowering your bills and then saving the difference. Maybe your goal is to be less busy? Your small change could be blocking off 1 weekend a month when you don’t plan anything. Want to save weight? Why not focus on your water intake and eating more vegetables? All of these things have a snowball effect, once you see the savings start to grow, you will want to figure out how to save more. Once you notice how you feel with more water and veggies you will start to wonder how exercise or less sugar will make you feel. By having a ‘reason’ to say no “Sorry I have that weekend blocked off to work on the house/focus on family/whatever” you will find saying no a little easier. By focusing on these small changes, you get wins, when you win you want more and then you can focus on the next small change. Have any small changes you will be making in 2016?? Need a little motivation? 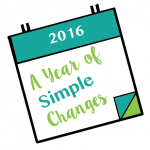 Sign up for A Year of Simple Changes, a twice monthly newsletter with small changes you can make every month that lead to big things.